Vallegrande in west of Dept. Santa Cruz belongs to the Andean highlands. Numerous rock art sites have been registered with a great variety of paintings and engravings that span at least several millenia. 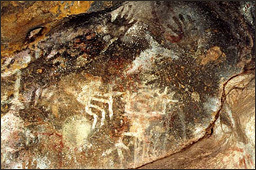 Two sites are presented here: A small cave with paintings and engravings executed in different periods. 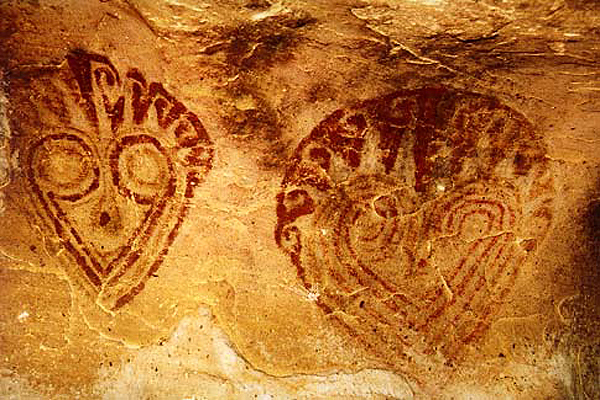 The oldest representations are more than 20 negative hand stencils. 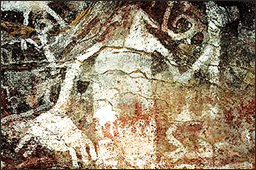 In later times a large stylized human figure was painted in white holding a staff and another object (height: 1,13 m). 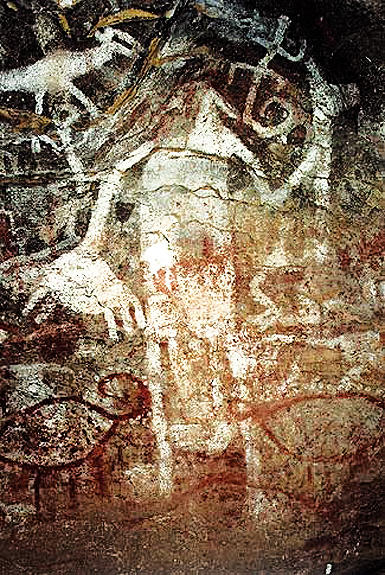 Some animals were partly painted on top of this anthropomorph, in red and white. 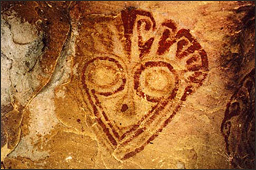 Apparently, a few abstract motifs in yellow and red represent the next phase, and finally there are white paintings belonging to the Colonial period, including a human figure holding up a cross, apparently scaring away another anthropomorph pictured in a frog-like fashion. Another small cave in Vallegrande, features two magnificent mask-like designs, one of which was chosen as logo of the Bolivian Rock Art Society (SIARB). It is estimated to date to about 1000 A.D. The rock art of Bolivia forms part of the Bradshaw Foundation - South American Rock Art Archive. The Bradshaw Foundation would like to thank Matthias Strecker and the Sociedad de Investigacion del Arte Rupestre de Bolivia (SIARB) for helping assemble material for the Boliva section of this archive.